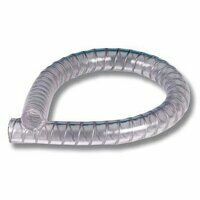 PVC hose wire reinforced for vacuum & suction with temperature range of -10 to + 60 deg C. It features plasticised pvc hose with reinforcement of incorporated steel spiral, as well as a smooth inside and outside. It is very flexible. Applications - particularly used for suction and delivery of liquids.